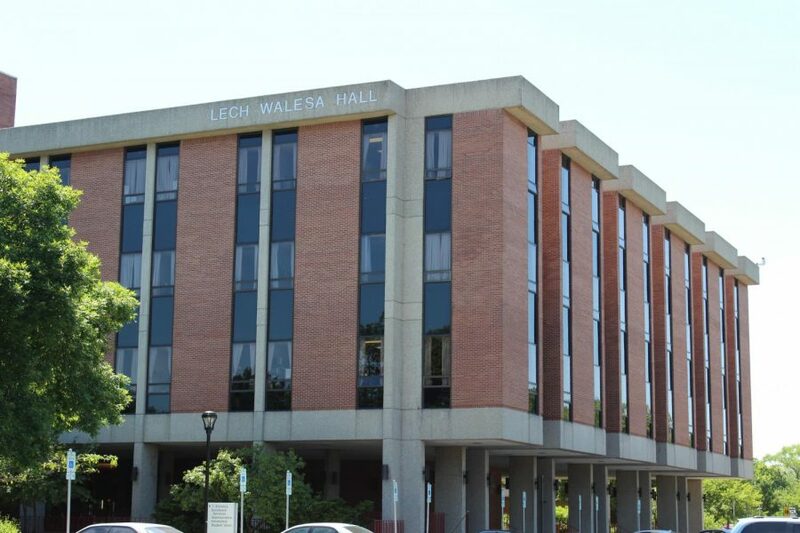 Lech Walesa Hall on NEIU's main campus. The artwork removal located in Lech Walesa Hall (LWH) was one of the first decisions made by President Gibson. There appeared to be outrage over the offensive move by the new president, but some professors who have offices in LWH expressed relief. In the Independent’s Aug. 28 article, “President Gibson: Art installation in Lech Walesa Hall ‘has now run its course,’ several NEIU community members expressed concern, but others did not agree. The artwork was a series of multiple slides that cycled through ten and fifteen second intervals, longer than a student would walk across on their way to class. The slideshow began with a timeline of Walesa’s anti-gay oratory followed by the university’s equality statement. Adjunct Lecturer from Women and Gender Studies Liliana Maricas recalled the historical elements behind why the artwork was displayed in the first place. Lech Walesa, who is a well decorated political figure, had his name engraved on one of the main buildings on the university’s campus according to Maricas. The minority Walesa referred to was people who identify within the LGBTQ community. “The artwork that was displayed on the monitors were a response to [Walesa’s] hateful and dispariging comments [towards] the LGBTQ community. The group decided instead to create an artwork that would represent the community despite the building’s commemoration of a person who is openly homophobic,” Maricas said. Sociology professor Dr. Olivia Perlow said President Gibson made a small step in the right direction by turning off the monitors. Dr. Juan Martinez, a new sociology assistant professor, said he isn’t familiar with the artwork in Lech Walesa Hall, but he is aware of the diversity on NEIU’s campus. “There’s no need for hate here … because this is an inclusive community,” Martinez said.